IT is one of those dream tourist projects that would put the region firmly on the map. 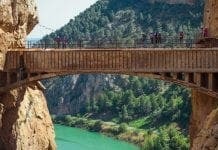 Now a plan to renovate the daredevil walkway Caminito del Rey, in El Chorro, is apparently back on track. The narrow 3km path pinned to the side of a vertical gorge – 100m above ground – is set to be repaired, after claims last month that the scheme had been scrapped. An agreement between the Junta and Malaga county council will see both bodies putting money aside to create the key tourist attraction. 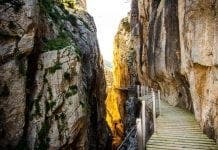 Dubbed ‘the most dangerous walkway in the world’, the path – built between 1901 and 1905, to transport workers building a dam on the Guadalhorce river – needs major work. It is missing handrails for most of its length and many sections have completely caved in. 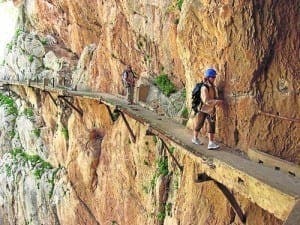 Despite this, every year hundreds of walkers risk their lives to walk along it, with one or two falling annually. The exact funding arrangements are yet to be finalised but officials confirmed that they expect the work to begin next year. “This is an emblematic project and will bring a huge economic boost to the area,” said a spokesman for the Junta. Next articleDid an angry expat start the blaze? How does fixing ‘the most dangerous walkway’ in the world translate to economic boost? Its not the ‘most challenging’ or ‘most difficult’ or ‘interesting’ or ‘great views’ etc. No, Most Dangerous! Rock climbers wont be interested, absailers have better choices, the public can walk around the bottom (its quicker, safer, and better views). Are they going to advertise as “Good chance you’ll die”. I guess the town hall doesnt understand the benefits of repeat business.